Green infrastructure does not receive anything like the investment or management that goes into grey infrastructure. CABE's Grey to Green campaign fuels a debate about whether this is smart, given the dangers of climate change and the opportunities to improve public health. The High Line, New York. Photo by Iwan Baan © 2009. 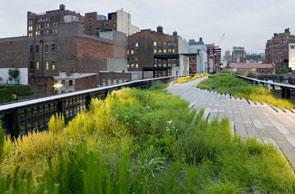 Parks and gardens, waterways, allotments, tree-lined streets and green roofs can provide a network of green resources. This green infrastructure could be a powerful tool to help towns and cities to adapt to climate change and improve public health. Yet decades of under-investment in green space services mean there is an urgent need for more people, with the right skills, to manage this living landscape, and turn green features and spaces into a functioning network. CABE’s Grey to Green campaign is calling for a shift in funding and skills from grey to green infrastructure. This means moving a proportion of investment in projects like road building and heavy engineering to networks of green spaces to provide flood protection and cut carbon emissions. The Grey to Green campaign is supported by 13 organisations including English Heritage, Green Space, Keep Britain Tidy, Landscape Institute, Landex, Lantra, Homes and Communities Agency, Institute of Groundsmanship, Institute of Parks and Green Space, Institute for Sport, Parks and Leisure, Royal Horticultural Society, Sustrans and Trees for Cities. Another supporter, landscape designer Dan Pearson, talks us through how creating green infrastructure is not just a technical exercise in environmental engineering. The campaign report, Grey to Green: how we shift funding and skills to green our cities, provides fresh ideas and evidence, showing how we could design and manage places in radically different ways. Nobody knows for sure how much green space there is in Britain, where it is, who owns it and what quality it is. This is particularly true in our towns and cities, whose green infrastructure remains unmapped on a national scale. Artist and designer Morag Myerscough used a combination of computer technology and painstaking hand rendering to select only the green elements from aerial photographs of three places – Gloucester, Liverpool and the London boroughs of Hackney and Islington. Separating out the green allows us to look at these places in a completely different way. Simply by recognising how much green infrastructure there is in each place allows us to make comparisons with the grey infrastructure and the resources we apportion to each. These engaging images give us a sense of the quantity and distribution of our green infrastructure – and question the very basis on which we map our towns and cities. We need maps of grey infrastructure to help us navigate, but they encourage us to think of our cities as made of concrete and tarmac with some green punctuation. These images show us another way of understanding the places where we live. Managing flood water has become a major concern for Gloucester following 2007’s Severn floods. The Environment Agency is working on alleviation schemes and flood storage areas could provide wildlife parks with public access. A Severn floodplain park is also proposed and a city-centre ecological park would give residents access to meadowlands (see the map). Liverpool’s green map shows civic parks running north to south, with large open spaces to the east. Vegetation spreads along railways and roads in the west, with green belt in the south. The Mersey Forest network includes new city woodland (see the map). Hackney has generous green spaces in its north and east, including part of the London 2012 site. Islington, by contrast, has the least green space per head in London, with Highbury Fields one of its few green spaces. So its waterways are important: the Grand Union Canal runs east to west across the borough (see the map). The green information gap: mapping the nation's green spaces advocates a single, shared, information resource – a kind of atlas – to help piece together the different elements of the nation’s green infrastructure – parks, gardens, allotments, trees, green roofs, cemeteries, woodlands, commons, grasslands, moors and wetlands. Strategically planned and locally delivered green infrastructure aiming to maintain a high quality of life in a housing growth area. A strong planning framework and area-based structures lever investment into new and existing green infrastructure to tackle quality of life issues in the Thames Gateway growth area. A public sector-social enterprise partnership using multi-functional green infrastructure to tackle multiple deprivation at the neighbourhood scale. A region-wide approach that successfully employs planning and advocacy to embed green infrastructure as a regeneration and sustainable development tool. A design-led approach to using urban agriculture to resolve sustainability and lifestyle challenges, leading to major investment from the Healthy Community Challenge Fund.